The weekly SitRep will be a bit later this week as we’ll be demoing our game at Gamebridge (https://www.facebook.com/gamebridge) in Middlesbrough tomorrow. This will be one of the first times we’ve shown the game to anyone so we are pretty excited! I’m moving the SitReps to Fridays from now on as it will be easier to include updates of events that happen in weekdays, such as this one. This Friday we will have a few new cool things to show from Daedalus as well as plenty of stuff from Gamebridge. 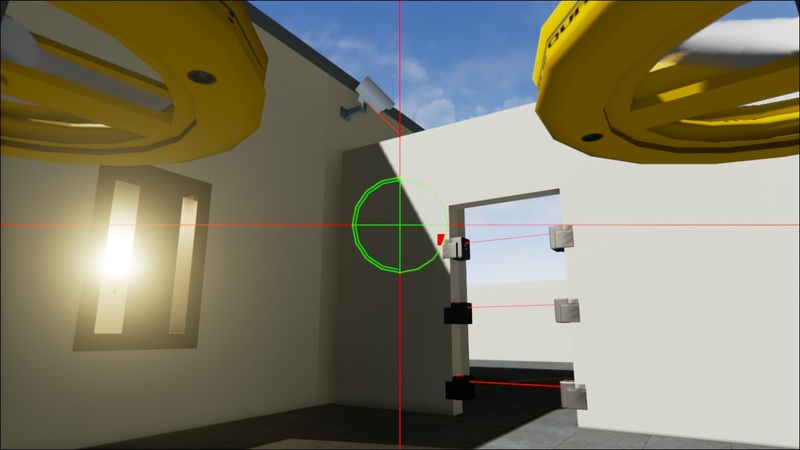 In addition to hacking, Tim has refined the camera behavior and tweaked it so it follows the player more accurately, returns to it’s rotation after losing the player, as well as several performance optimizations. 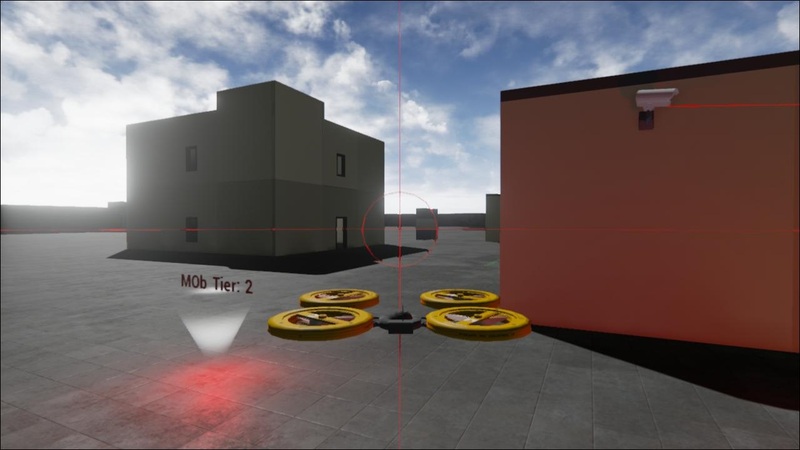 We have a basic form of objective marker at the moment, if the player collects them all in a specific order without being detected for too long, it’s mission accomplished. We aim to flesh this out to include hack objectives and objectives that cannot be completed while the base is on alert. 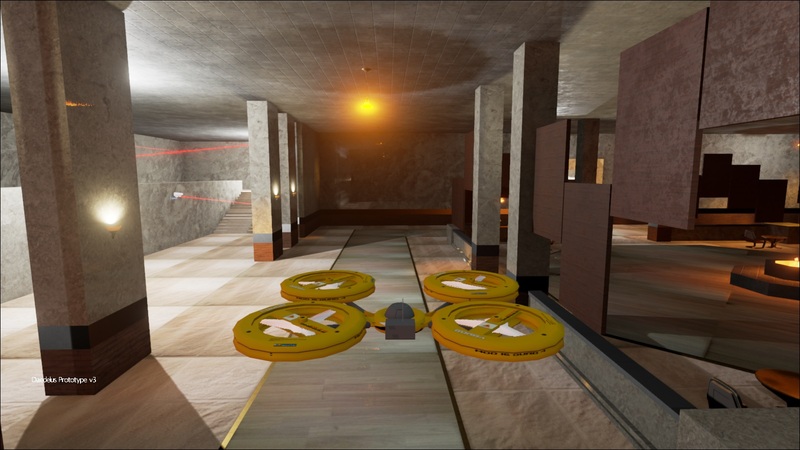 We have a very basic laser tripline in at the moment that will fail the mission if the player touches them. This will be expanded to group them with a terminal which can be hacked to disable the lasers. 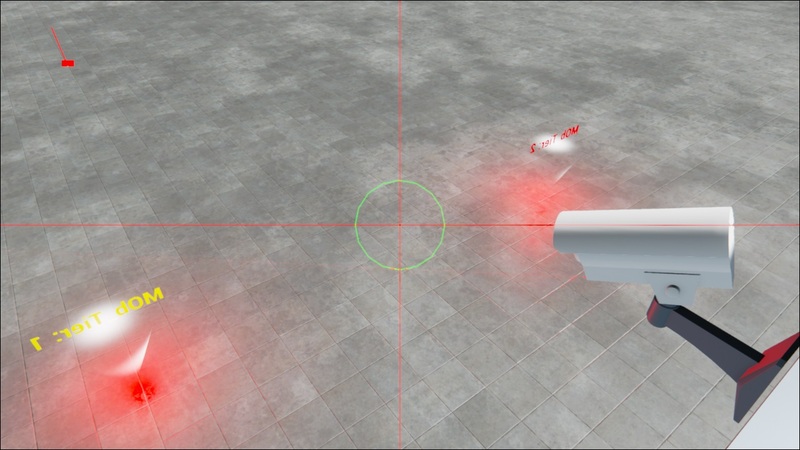 It is possible to nudge objects between the lasers to disrupt them, allowing the player to fly through without setting off an alarm. Thanks for checking the game out! It’s all very bare-bones at the moment but things are progressing well. There will be an update like this every Wednesday (provided I am available to update the blog), so stay tuned for more developments. So, after a longer wait than I first promised, I can finally reveal some information and screenshots of our new project, Daedalus! 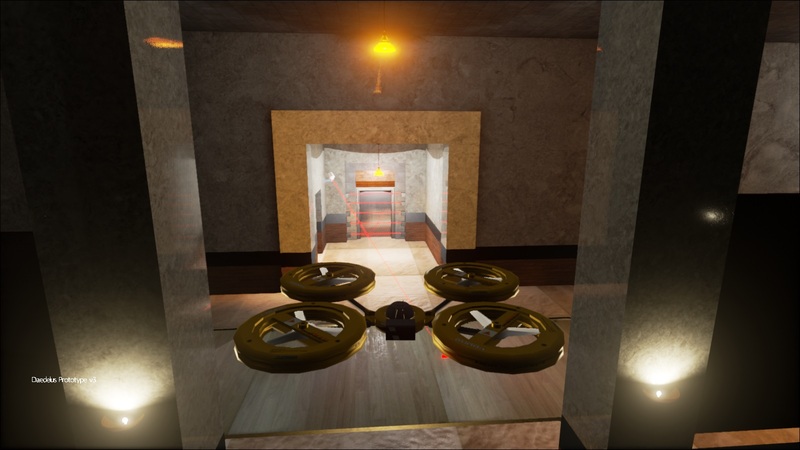 Daedalus is a third person flying/stealth game, which sees players take control of a special stealth Quadcopter as they infiltrate hostile areas. 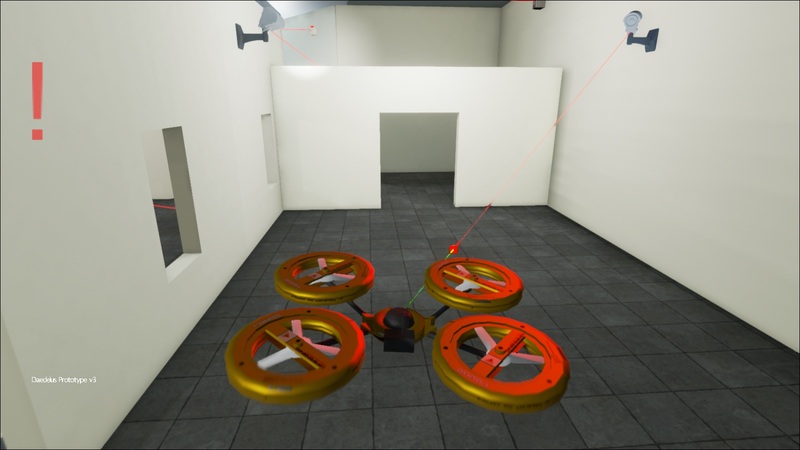 The player will need to master both piloting and stealth skills to tackle a variety of challenging missions that would be impossible for a human being to accomplish. Daedalus is developed by Prospect Games, using the very shiny Unreal 4. We aim to create a singleplayer campaign, a few cool multiplayer modes and maybe some custom missions/challenge maps if we are able. We want to inform and involve people in this project from the beginning as it allows us to craft the game more precisely to what people want as well as what we think is cool, so we’re eager to hear from you all! Player has been detected by a camera in the challenge map. I’m a huge fan of the stealth genre and have always wanted to make a stealth game, so I’m excited to hear what people think of the concept and what they would like to see and play in the finished thing. 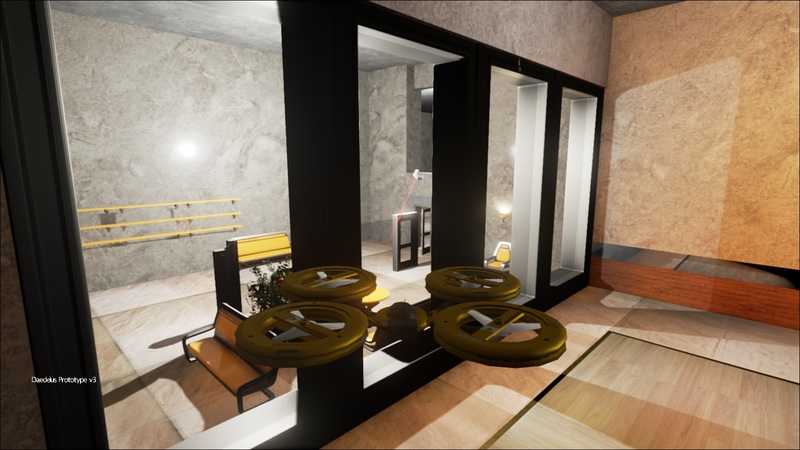 It’s very early days (it’s about a month since I left my job at Codemasters for the indie life) but we’re starting to get into the swing of things and hopefully that means more frequent updates, images, videos and playable builds. When I originally pitched the concept to Andrew it was going to be a side scrolling flying game with stealth elements (think Flappy Bird, except when you crash you can be heard). 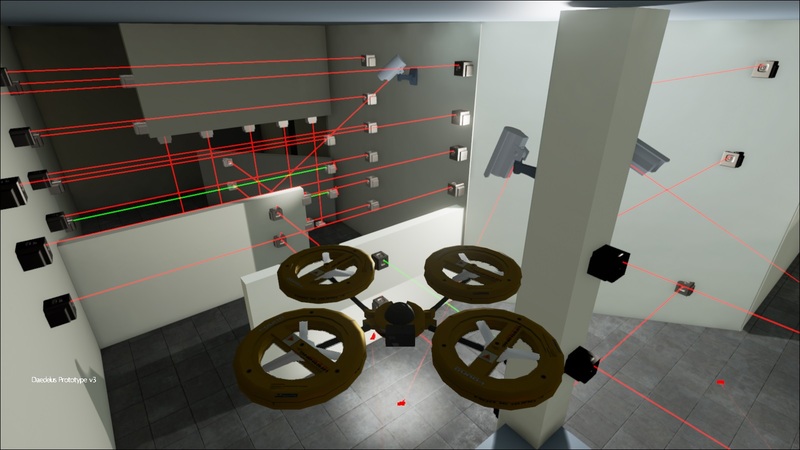 This evolved into a side scrolling quad copter stealth game with hacking elements (sort of in the same vein as Gunpoint), until we looked into Unity and Unreal 4, at which point we decided to make it 3D and follow a more “Splinter Cell meets Descent” vibe. My role in the project is a programmer/designer, and providing occasional art where needed. One of the things I’m most excited about is learning more about the various fields of game development I know nothing about (mainly every aspect).